crafty goodies: Clear Scraps and those Mixers! I'm home from Indiana. I went with shingles and came home with them , too. I never have had the shingles before so I thought I had pulled a muscle in my lower back. I'm so glad I didn't know how much fun these were ~ NOT!!! I used the Banner Mixers and the Clouds Mixers. I traced around the pattern paper (Jillibean Soup) and adhered to the acrylic shape with Zip Dry by Beacon. The library card envelope is from The Curtsey Boutique. I love love love this! LOVING the photos, the colors and the chevrons!! And I hope you feel better soon!!!!!! I LOVE this page. The base page just rocks and love the fancy footwork on the banners too. Man I hope you recover soon shingles is nothing to mess with. Love the background on this. Great idea to use a white border on the photos and outline some of the shapes in white too. Fab page. Feel better Connie! I love what you did with this layout..so pretty! 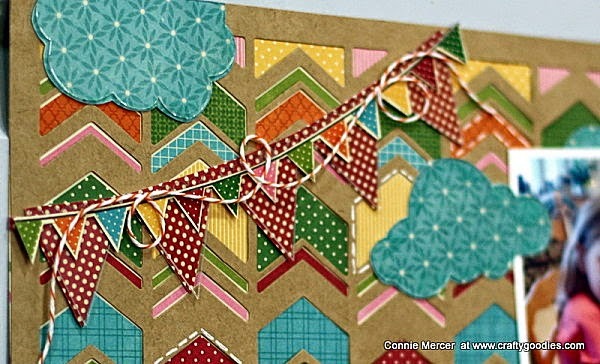 That die cut background is fabulous and love the entire layout! so sorry to hear about your shingles. i know they can be very painful. Have been saving this project in my e-mail so I would remember to stop by and let you know how fantastic I think it is!! Love your Blog!!! Shared it on my fb page- "Southern Angels Boutique"